Interim Police Chief Gary Tuggle said at a late-night news conference that gunfire erupted just before 6:30 p.m. in a west Baltimore neighborhood. 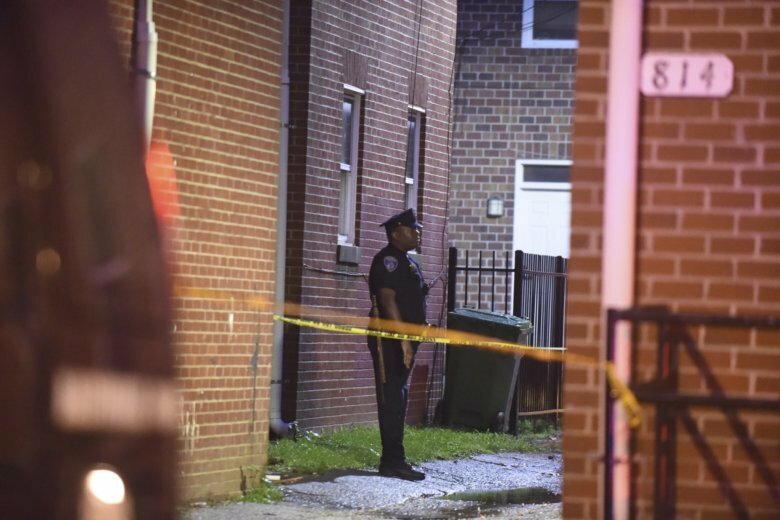 BALTIMORE (AP) — A Baltimore police officer assigned to a crime suppression detail was wounded by gunfire and the suspect who fired at him was fatally shot in an alleyway in one of the city’s rougher districts, Baltimore’s interim police chief said following a shootout Sunday evening. Police have given only the broadest outline of the case and said there were no immediate plans to hold a news briefing Monday. At a late-night news conference where the shooting erupted, interim Police Chief Gary Tuggle said a crime suppression unit “came up on the suspect,” but he hasn’t elaborated on those details or disclosed precisely what officers were doing in the gritty area at the time. “There’s been a lot of violence in this area. And we have taken extra steps with extra personnel to surge into the area to address the violence. This was a part of that initiative,” Tuggle told reporters at the West Baltimore crime scene. The wounded male officer, a police veteran whose identity has not been publicly released, was treated and released Monday from the University of Maryland Shock Trauma Center, according to police spokesman T.J. Smith. Police have also not released the name of the man who they said shot the officer before being killed. No one else was hurt, according to authorities, and officers with the crime suppression initiative weren’t actively seeking the man who was fatally shot. Following the shootout, the immediate area was quickly cordoned off and only investigators and local residents could get in and out. Bright lights were brought in on towers to illuminate the scene as officers investigated into the wee hours. Two people were shot and wounded last week in the same troubled West Baltimore neighborhood. A number of crime suppression operations have been carried out in other districts of Baltimore. Tuggle said this was just another area where that initiative was being undertaken. Investigators have been looking at body-worn camera footage and spent late Sunday and Monday’s early morning hours gathering evidence. The neighborhood crime scene was released by authorities shortly after sunrise. Baltimore police leaders have been ramping up efforts to tame the city’s violent crime scourge. The Maryland city of roughly 615,000 inhabitants ended 2017 with 343 killings, bringing its annual homicide rate to its highest ever: roughly 56 killings per 100,000 people. In comparison, Los Angeles, with about 4 million residents, saw 305 homicides last year.